Sure she can! Even the most unlikely of equine candidates run the risk of getting thrush. It happened to a friend of mine just a couple of weeks ago right here in the arid Sonoran Desert. 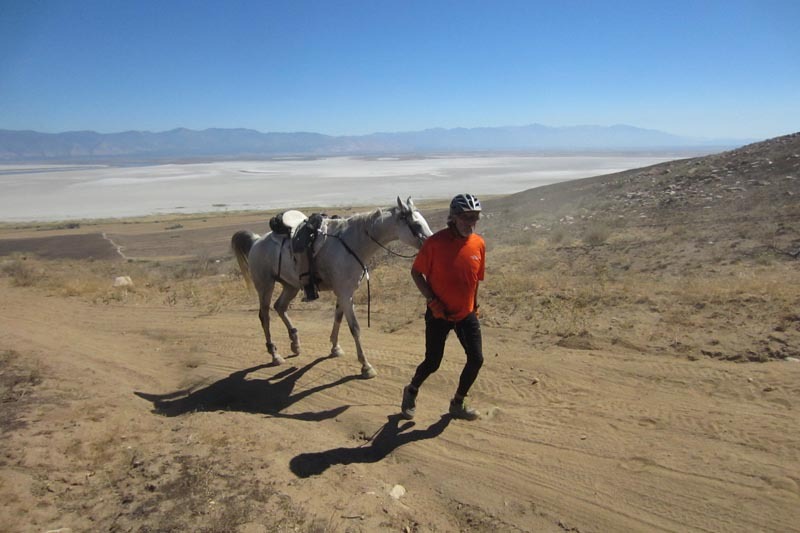 The horse had been slow to transition from shoes to barefoot, and had recently become very sensitive on his fronts after a long period of being sound. I was cleaning out his feet with a hoof pick when I discovered a hole in the center of his frogs on both front feet and he was very tender in that area. As I cleaned out the hole, he even began to bleed. Like most horses in the area, this horse is kept on a dry lot made up of decomposed granite and sand. The summer and fall temperatures are well over 100 degrees during the day and there is little to no precipitation. So if you think thrush lives only in humid conditions; think again. Some vets and hoof care practitioners speculate thrush occurs when a mineral or vitamin deficiency is present. Thrush seems to be more common in the spring and in milder climates. The bacteria that causes thrush is anaerobic, which means it thrives without oxygen. * Noticeable pungent, foul smell when picking the hoof. * Thick black substance in or around the frog. * Soft frog with unusually deep groves. * Sore and tender heels. Prevention is obviously key. Clean out your horse’s feet as often as you can. Even if you clean out your horse’s feet four times a day, there is still a chance thrush can start under the frog. For treatment, pick a thrush remedy. There are countless treatments and remedies for thrush on the market today, but which one should you choose? Many hoof care practitioners are currently recommending White Lightning, which is active Chlorine Dioxide (CI02) and is used for treating equines for thrush, white line disease and skin fungus. It is harmless to the tissue itself, but acts as a bacterial, fungicidical, sporidical and virucidical agent (so it can also be used for things like Rain Rot, too). Unlike Hypochlorite, Chlorine Dioxide does not produce toxic by-products. Chlorine Dioxide is a gas, and an unstable one at that, so it cannot be stored in a container. The use of White Lightning requires adding an equal amount of white vinegar to create the chemical reaction required to make CI02. Unlike liquids, the gas can permeate the areas around the frog that are difficult or impossible to reach. The treatment can only work if the treatment area is completely sealed. This requires using either an EasySoaker with saran wrap taped to the boot and to the leg, or soaker bags, which are available online. The treatment takes about 45 minutes and once the gas is released, the remaining liquid is harmless. CI02 is not affected by water, but any dirt particles present can prevent the treatment from getting to all areas of the foot. 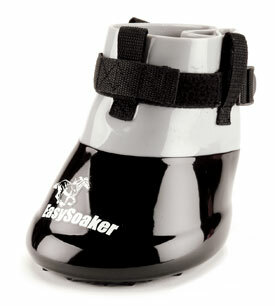 So try adding water to the soaker boot or to the bag: it will help loosen the dirt while keeping the foot soft and supple, allowing the gas to penetrate all hidden areas in the frog and collateral groove. 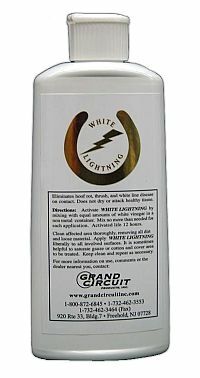 A White Lightning Gel is also available, which is easier to use but not as effective. You can use soaking bags or the EasySoaker with saran wrap and tape around the leg. If you choose the boot, you can re-use it countless times for this and for other procedures. You need to decide what is right for you and for your horse, but many practitioners suggest monthly treatments during the winter when the horse is most likely to suffer from fungal infections. If you are treating highly diseased feet, you may even want to apply daily for a few days and then spread out the treatments to two or three times a week. Talk to your hoof care practitioner if you want to purchase the product, or Google White Lightening Treatment to find a supplier near you. This link takes you to one distributor, but there are many to choose from. This link gives some additional background and tips on the best way to apply the product. Post a comment below (or if you’re receiving an RSS feed of this blog, click here and then scroll to the bottom of the post) to let me know what your prefered remedy is for prevention and treatment of thrush. I’d also like to know what your experience has been with White Lightning. EasyCare does not currently sell any thrush prevention products. But if we were to do so, what would you recommend we add to our product line?